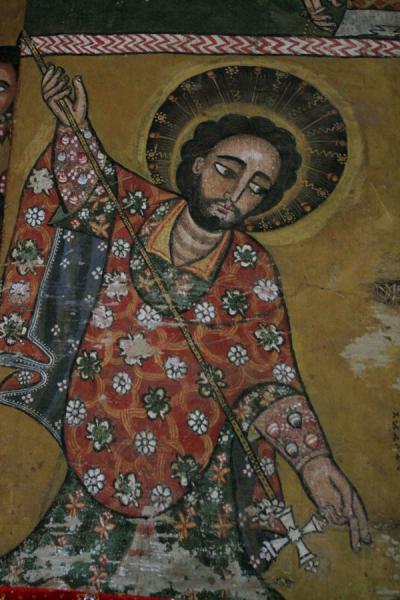 The walk to Debre Birhan Selassie church is easy and pleasant, going through suburbs of the former capital of Gonder. 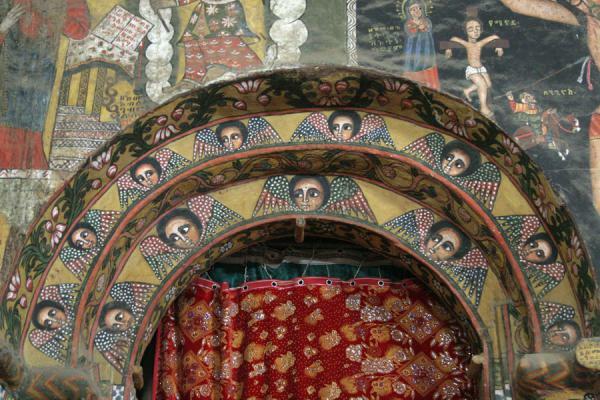 After buying your ticket outside the walls of the church, be sure to locate the priest; even here, the doors remain closed unless there are visitors. 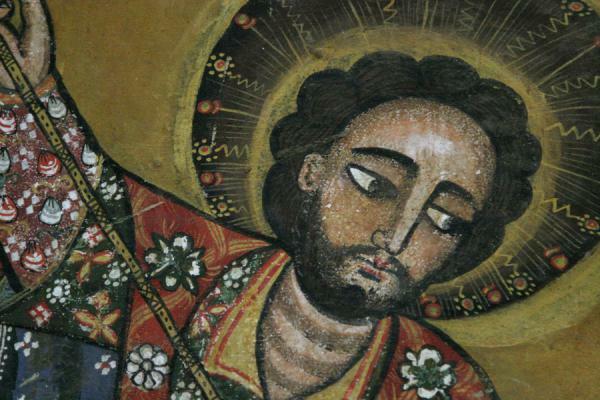 When the white-robed priest finally opens the doors on three sides of the church, a splendid spectacle opens before your eyes. As daylight reaches the walls and the ceiling, it makes your jaw drop. 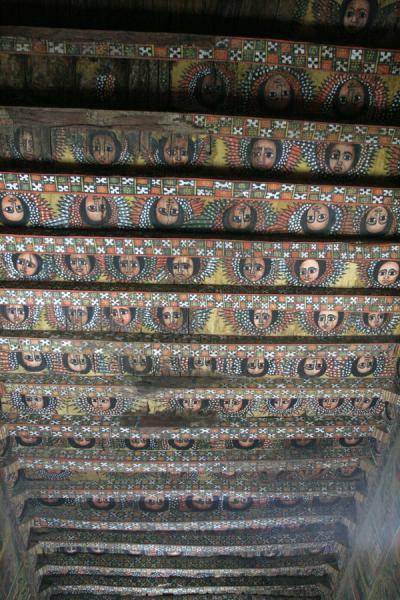 Bright coloured and well preserved scenes from the Bible on the walls, and the wooden ceiling completely covered by winged cherubic faces. 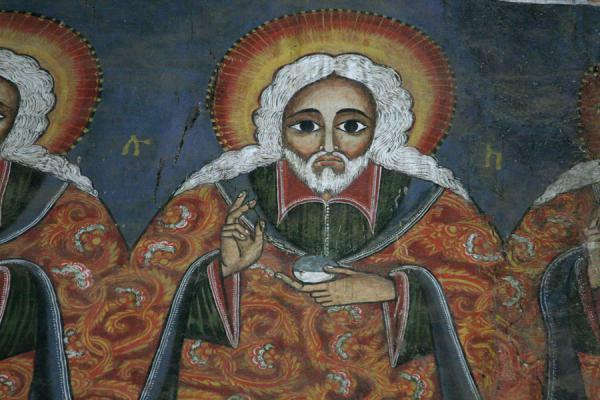 This church does not escape the fondness of legends in Ethiopia: while most other churches in Gonder were destroyed by the Dervish of Sudan, Debre Birhan Selassie escaped because it was protected by brave bees. 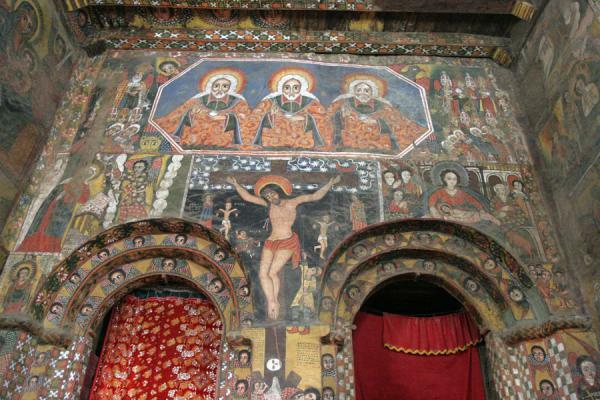 Whatever the explanation for the church being saved - just imagine it would not have survived... - the Mountain of the Enlightened Trinity, as the name translates to, is indeed one of the prime churches of Ethiopia. 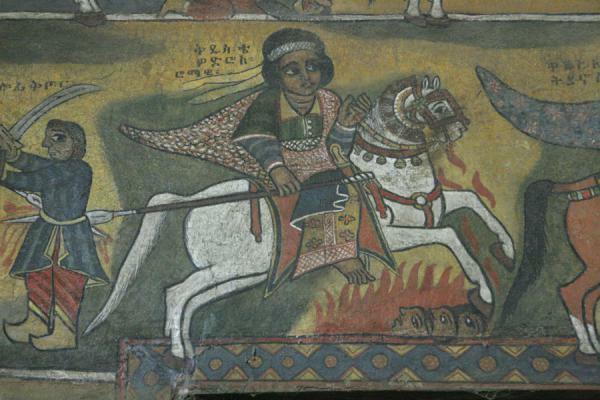 It was founded in the late 17th century by Iyasu I, but the building had to be rebuilt after fire and lightning. 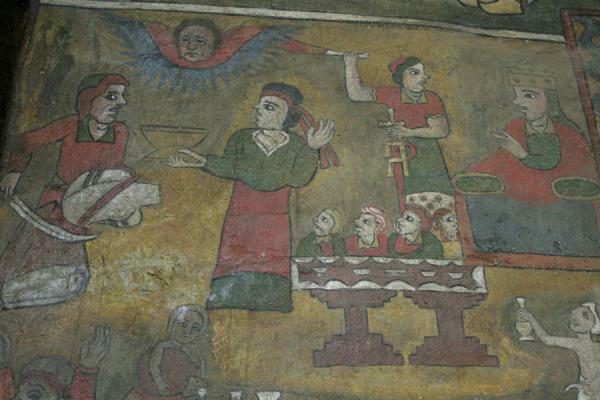 Probably, the church is a good indication of the riches of other places around Gonder, before the wars that destroyed it. It is easy enough to spend time in the church, even though it basically consists of one large hall. 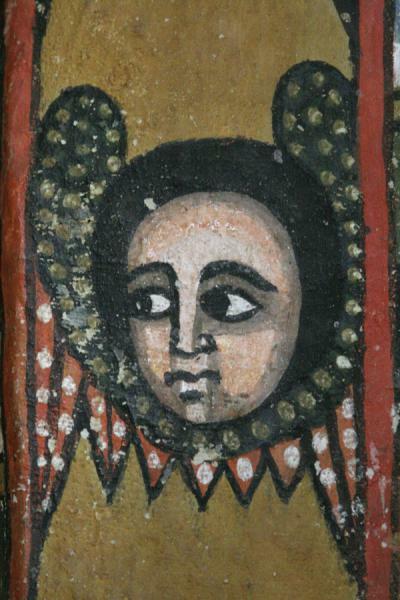 As elsewhere in northern Ethiopia, the walls contain biblical stories, apparently for people who cannot read, depicting several scenes of the life of Christ and various saints. 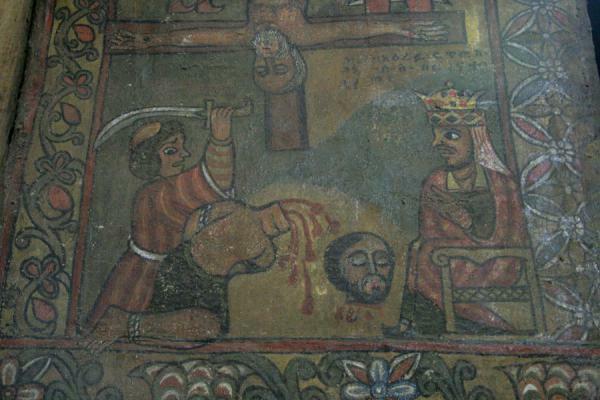 Some of the scenes are brutal, beheadings are depicted with bloody detail, and the devil also made it to the colourful walls. 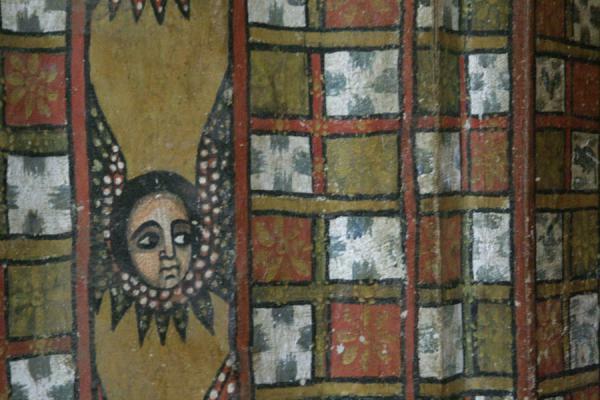 But I guess any visitor is drawn to the angels of the ceiling. 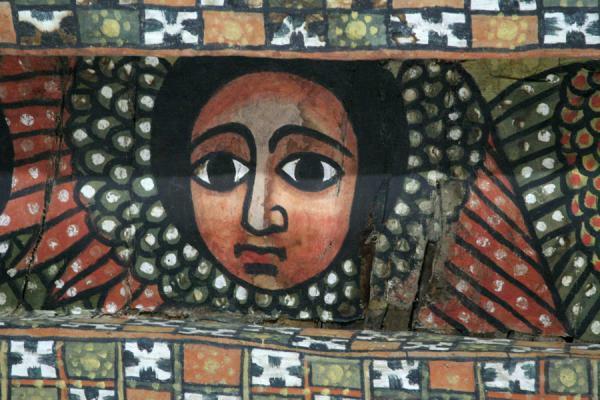 Every single cherubic face is different: some look sad, others bright, some look smart, others dumb. They all have wings. The longer you stare at them, the more they appear to be staring back. 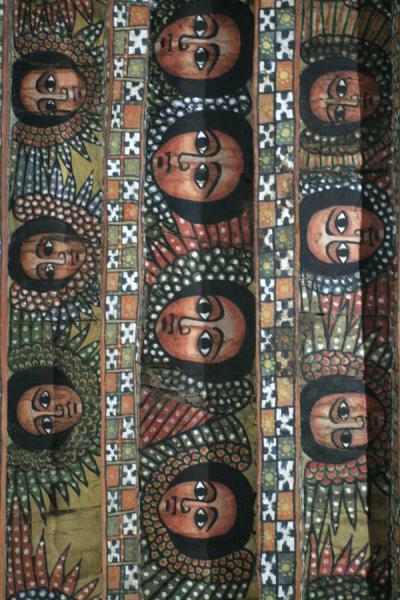 When the priest finally switched off the light and daylight was vanishing, the large eyes continued looking at me, the white in their eyes seemed always brighter while the rest of the ceiling slowly faded away in the darkness of the night. 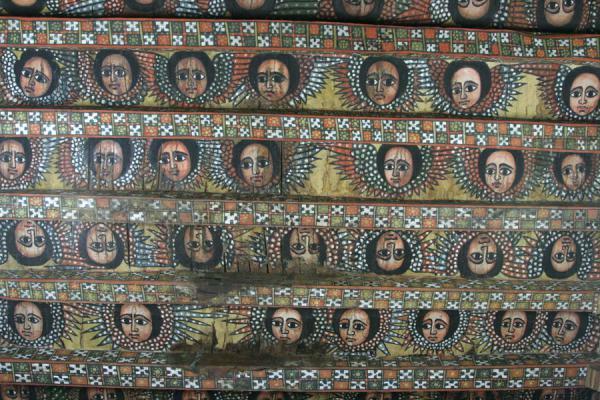 Personal travel impressions both in words and images from Debre Birhan Selassie Church (). Clicking on the pictures enlarges them and enables you to send the picture as a free e-card or download it for personal use, for instance, on your weblog. 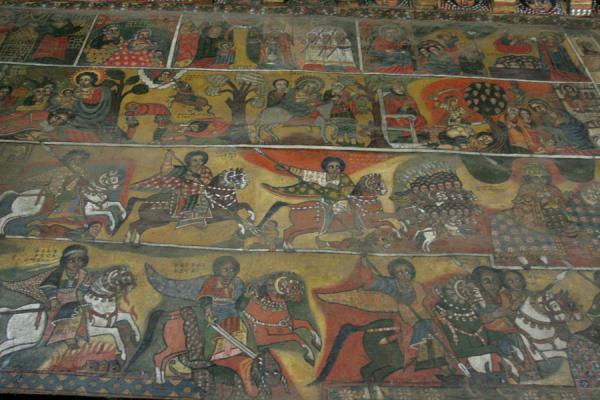 Or click on the map above to visit more places close to Debre Birhan Selassie Church.